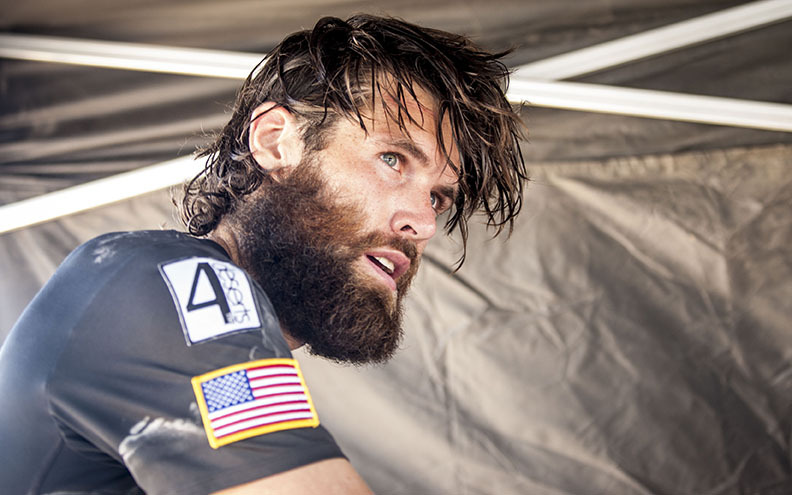 Ultra Zandy | I like to run, a lot, in New York City and all over the world. Exercising in public in Afghanistan carries significant risk to personal safety, according to a female competitor from Afghanistan with whom I chatted while I was photographing the 2015, 4Deserts Gobi March. The “March” is an annual 250km, self-supported foot race through the Gobi Desert in China’s Xinjiang Province which attracts runners from around the world. 40 nations were represented in this year’s race. 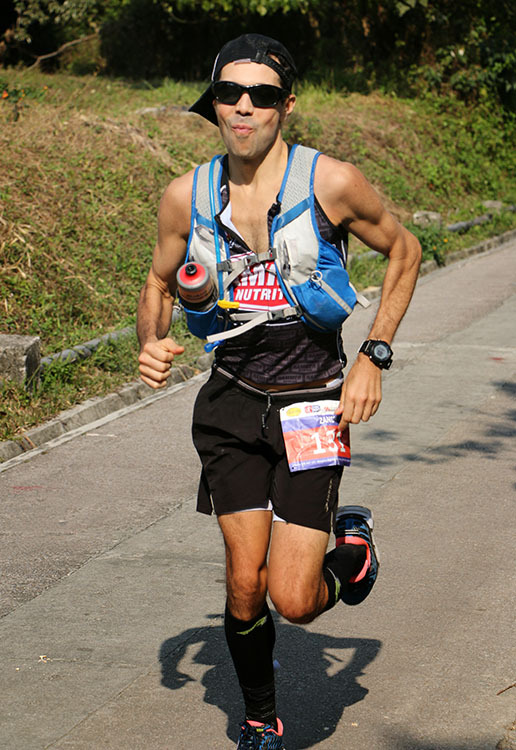 The Afghan runner, was able to travel to China and race thanks to the Free To Run charity. Free To Run creates opportunities for women and girls to get involved in running, fitness and outdoor adventure in some of the most difficult places on earth. This year two women represented Afghanistan as Team Asma’i and finished as 4th team overall. The order of finish for the Afghan women was not important. Considering they could not train on a regular basis, and when they did exercise, it was largely in secret. 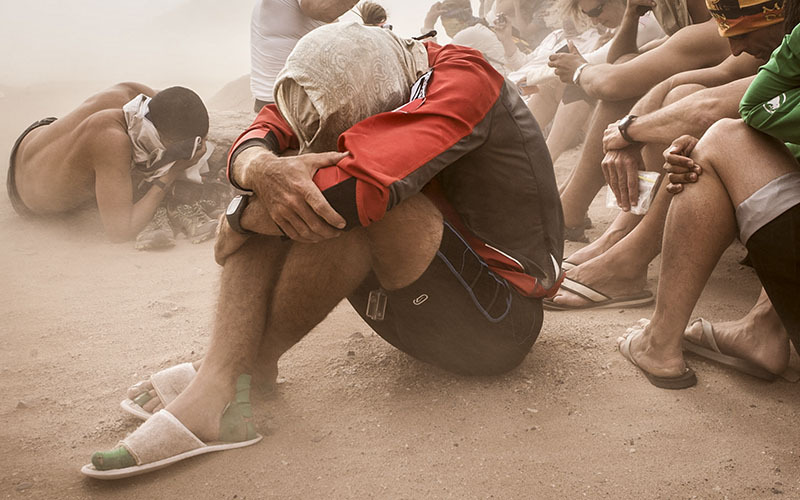 It was a deeply emotional experience for all – both for the two women who were at last running free, and also the rest of the field and 4Deserts staff who were reminded that the ability to choose to run or not, should not be taken for granted. The Afghan girls were not the only runners who caused us to rethink what is possible? Also among the 164 competitors were three blind runners. With the help of guides, all three finished the challenging course. Vladmi Dos Santos of Brazil and guide Matt Moroz finished an impressive 49th overall. When accounting for the extreme climates and treacherous footing, the achievement of the sight impaired runners is even more extraordinary. Amazingly, of the several sprained ankles I witnessed this past week, none belonged to the visually impaired runners. 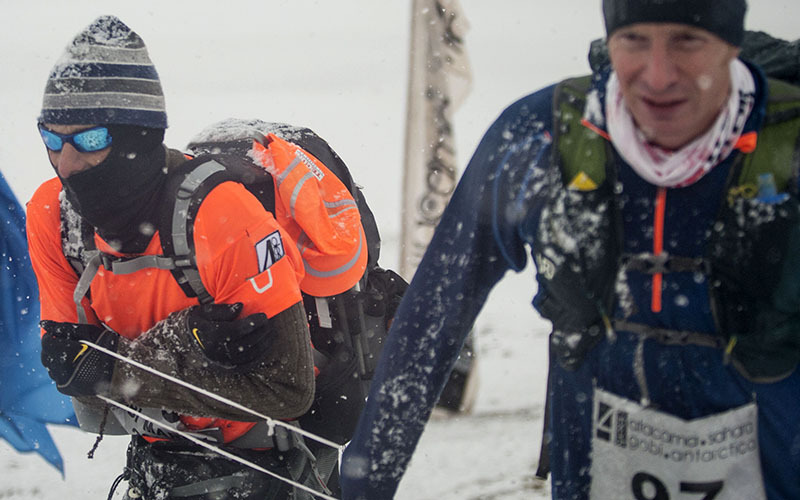 Also, at different stages of the event, competitors ran through a blizzard, freezing rain, biting headwinds, and through blazing 100 degree temperatures. 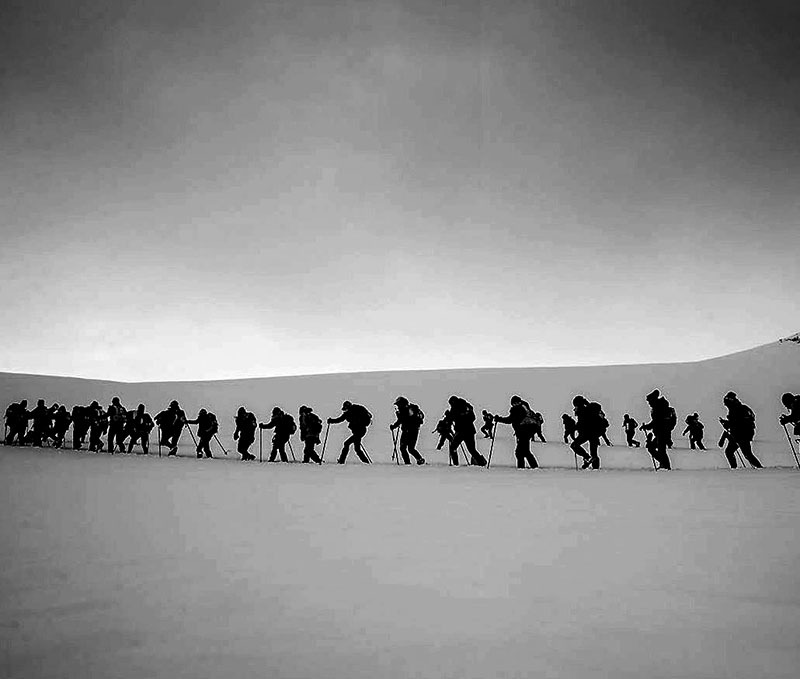 The cold was particularly painful for the blind runners who could not release their grip on the string which was attached to their guide, and warm their hands in their pockets as did other runners. Then, no sooner had the final, 80 kilometer stage concluded, and a sandstorm straight from The Mummy Trilogy blew through the campsite. The storm ultimately forced the cancellation of the final 10km stage and a resulted in a bussed retreat to the host city of Hami. Fast approaching sandstorm. Photo By Zandy Mangold. 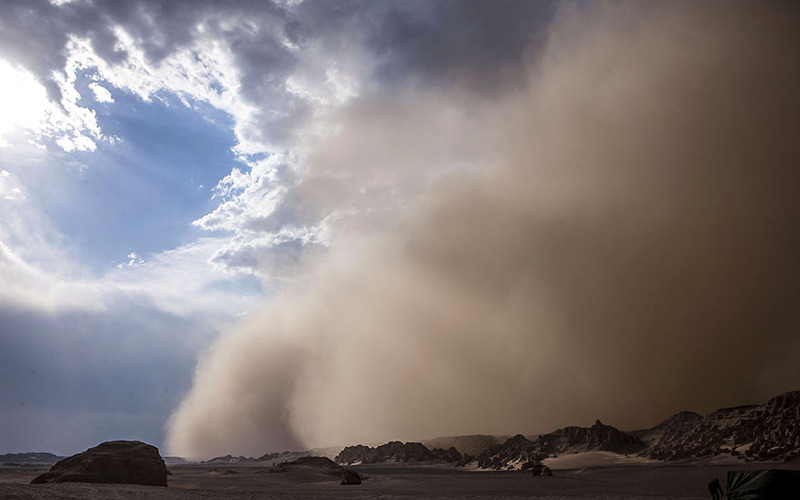 Runners take shelter from the sandstorm. Photo By Zandy Mangold. The physical and emotional limits of all runners and staff were tested to their limits, and beyond. While we may have suffered, there was no room for complaining. 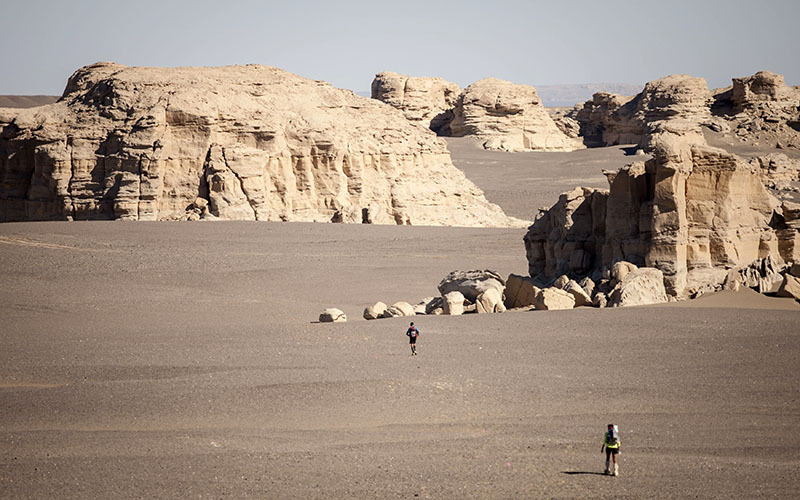 Modernity, tradition and runners meet in the Gobi Desert. Photo By Zandy Mangold. Overall champion, Adam Kimble. Photo By Zandy Mangold. “Why do we hold the race in May when it is so hot and humid? In order to make it challenging,” explained Keys 100 Race Director Bob Becker to the runners gathered in Key Largo, Florida for the pre-race briefing. While Becker’s comment elicited some nervous laughter, it was nevertheless precisely the challenge of finishing such a race which had drawn us all to South Florida. 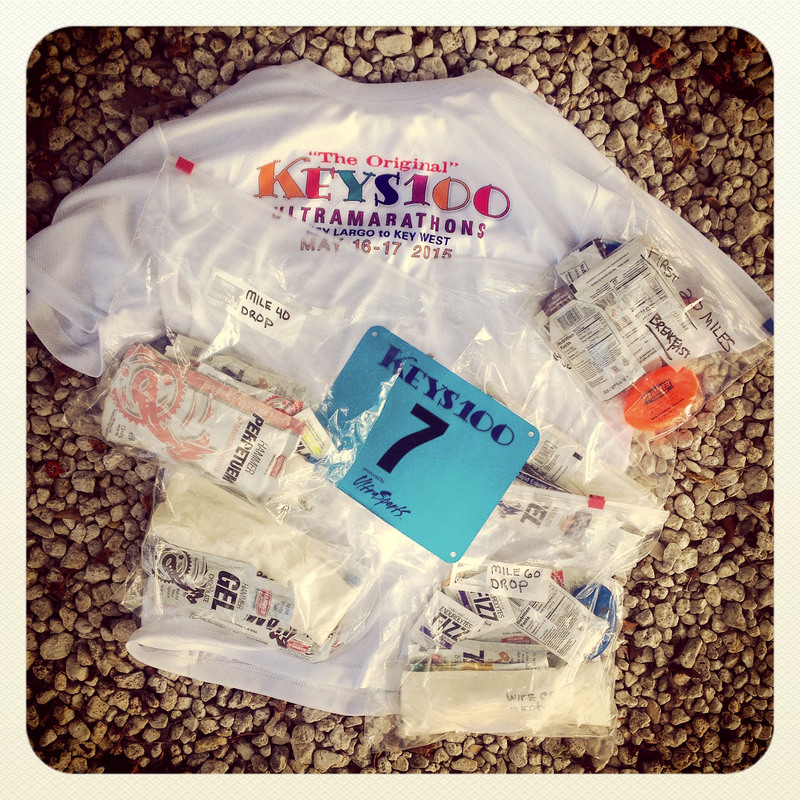 I, for one, had competed, and suffered in the 2014 event, and was nevertheless looking forward to another jog through the Keys. In addition to the steamy climate, the course alternates between the slanted shoulder of a road and a hard, concrete path. “Hard concrete” may be grammatically redundant, but it is appropriate. The shredded soles of hundreds of brand new running shoes and bruised feet are evidence of this particularly challenging surface. When the race started at 6:20 am in Key Largo, I was already dripping sweat. Even so, the first 15 miles were almost comfortable as the pace was easy and I was not dehydrated or overheating, yet. I even took time for selfies and had energy to chat. 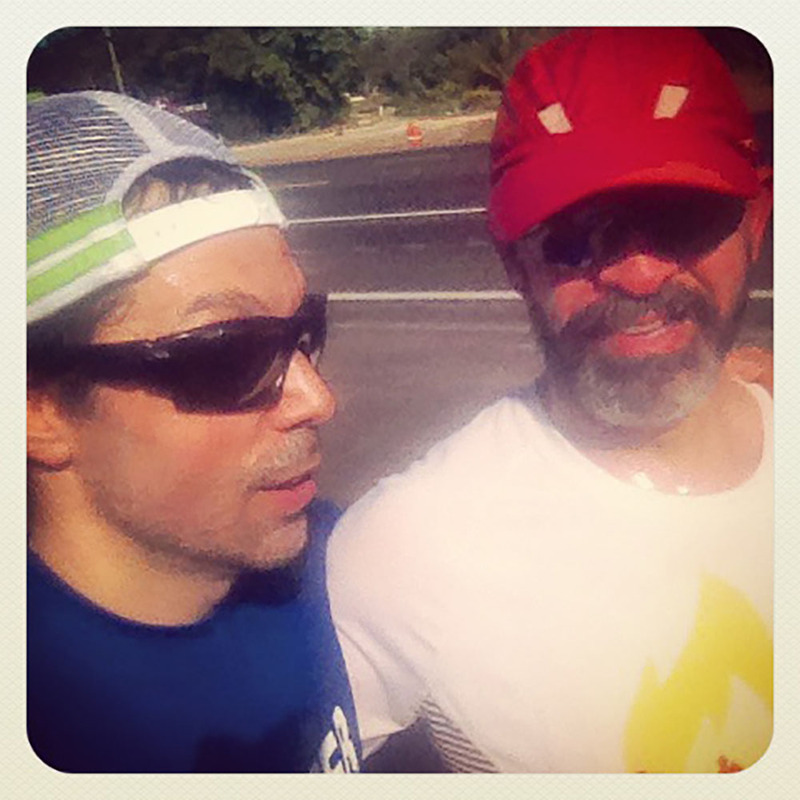 Mile 16 with Ashkan Mokhtari. As the day wore on, temperatures rose to the mid-90’s, while the humidity remained. Sparse clouds did nothing to shield runners from the sun. At one point along the course, a sign announced that we were about to run through “The Tunnel Of Hell.” Or maybe it read, “Welcome To Hell’s Tunnel.” Either way, the concrete path meandered through a heat-trapping tunnel of boondoggled bush for several miles. I wanted to speed through this phase of the course, but my body was too stressed for anything faster than about a 12-minute run/walk pace. A tedious pace under normal conditions, but a top-speed after 40 miles under the Floridian sun. 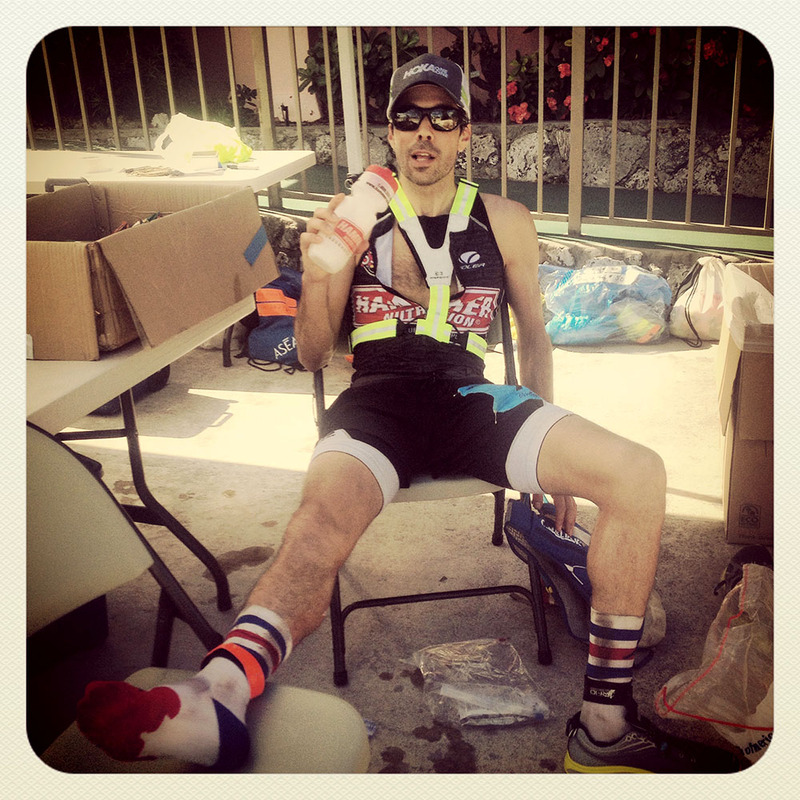 I eventually made it to the 50 mile aid-station, but after about nine hours on the tarmac, I was thoroughly cooked. 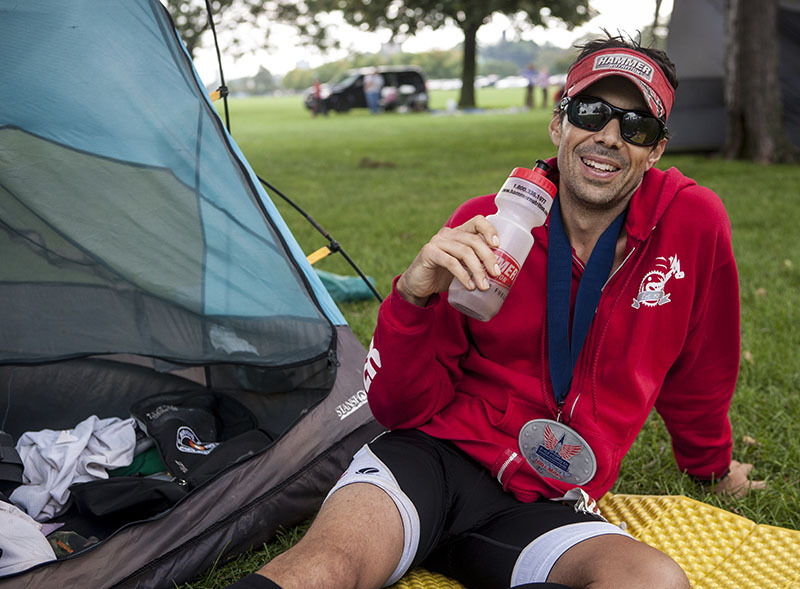 I knew from past ultra-marathon experiences, that I would be better off, later on in the race, if I cooled my body now, as opposed to pushing myself past the point of recovery. Thus, I sat in the shade for 30 minutes with ice cubes on my head, replacing them with fresh ice as they melted. Cooling down with an ice-packed hat at the 50 Mile Aid Station. It was discouraging to see other runners go past, but I reminded myself that ultra-running ultimately isn’t about competing with other runners, but rather oneself. If I had tried to keep pace with other racers I would have soon overheated or my muscles would have cramped. Unlike shorter races, where one can match pace with other runners, in ultramarathons, each runner has to find his or her optimum pace and fueling strategy to get the finish the fastest. Furthermore, I was running the race without a crew so it was prudent to err on the side of caution. Before leaving the aid-station I swapped out my well worn Huakas with a brand new pair which I had packed in a drop bag. I paid a price for the long, but necessary break. When I restarted my quadriceps and and hip flexors were extremely tight and I noticed sharp pains in my right hip and left knee. It was a discouraging moment because running another 50 miles seemed impossible due to the frozen muscles and aches. 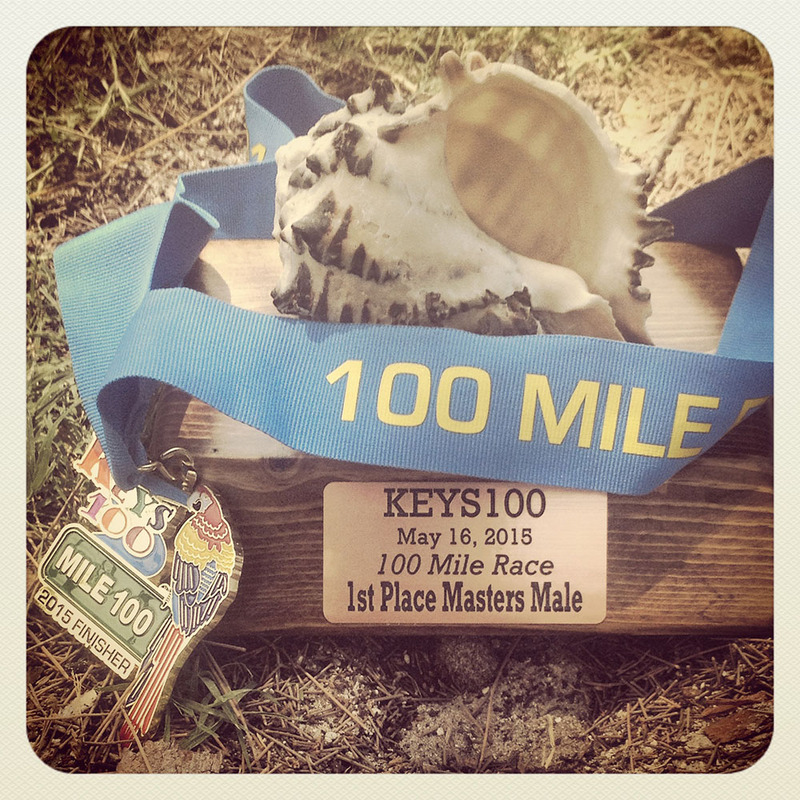 Slowly, my muscles warmed up, and I endeavored to not stop for the rest of the race. Along the way, I popped 200 milligrams of advil and tylenol, but only after drinking enough water and electrolytes that my pee was nearly clear. Eventually, the sun set and temperatures dropped enough for me to increase my pace without the risk of overheating. It was still hot and I continued to pack ice under my hat for rest of the race whenever possible. I did not negative split thanks to the extended aid station break, but I did run the second fastest split of all the runners over the final 25 miles and finished in 19:55, 5th overall, and First Place Master. There was very little room for error in the steamy South Florida climate and the right nutrition and gear were critical to finishing. As usual, I relied on a steady diet of HammerNutrition which included: one Endurolyte Extreme capsule and gel every hour, one Sustained Energy serving every 25 miles, one Endurance Amino capsule every hour and every couple hours a Fizz tablet was added to my CamelBak bladder. Many bananas and a potato rounded out my calories. Race nutrition prepared pre-race and distributed at drop points along the course. The CamelBak Marathoner vest was perfect for this race as the bladder holds up to two liters of water and it also has two front pockets for water bottles. I used one water bottle specifically for dousing myself with water in order to keep cool, one bottle held my Sustained Energy mix, and I drank from the bladder. It’s official, I am in a relationship, with the Huakas. With substantial cushioning and light-weight, they have proven to be an amazing shoe for both short and long distances. Orangiant Juice. Definitely in Florida. 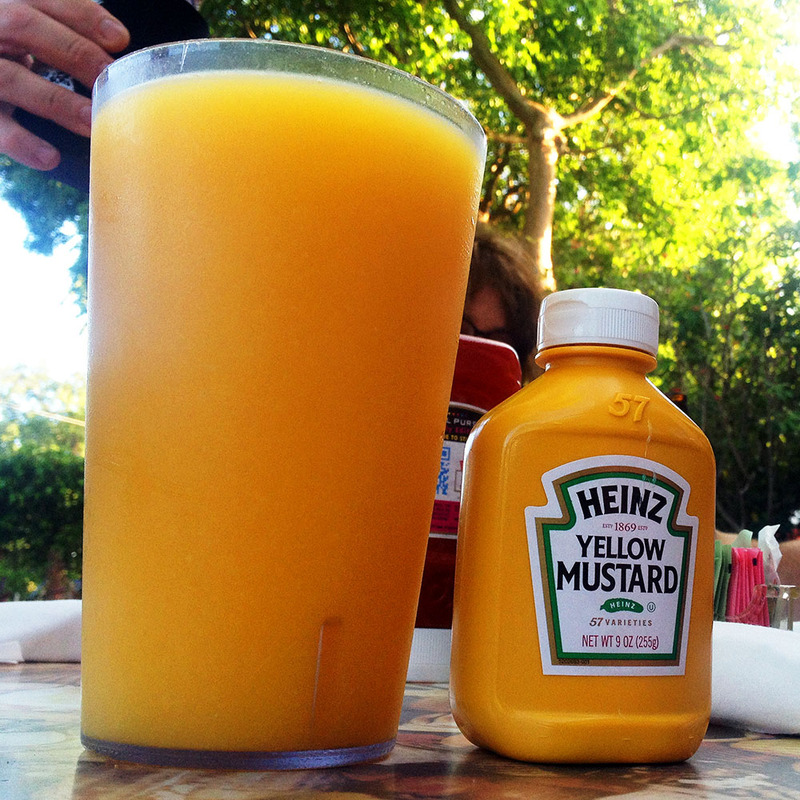 Mustard for scale. 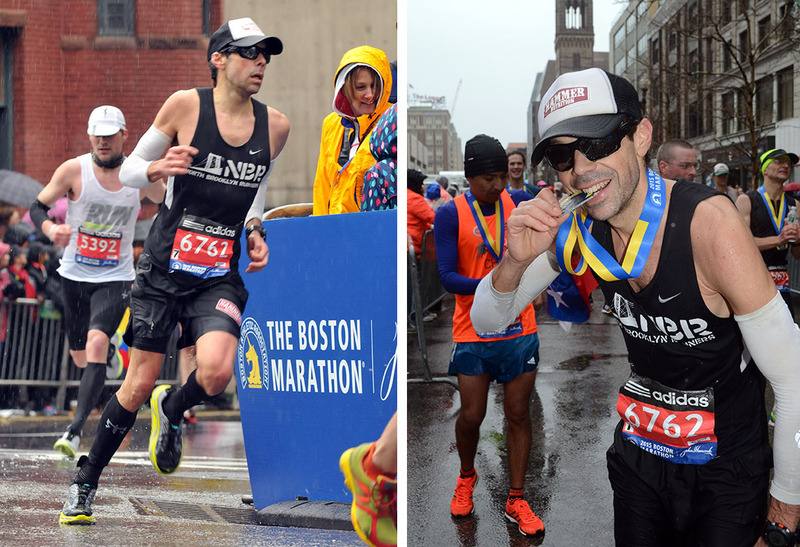 The 2015 Boston Marathon was the coldest, wettest, head-windiest marathon I have every run – but relative to the brutal training conditions this winter, it was a balmy spring day! At least that is what I told my legs as I toed the starting line. The first-half of the race is an easy, entertaining jog through the suburbs. Already boozed up Bostonians line the course, ACDC blares from occasional speakers and the planet’s densest population of running groupies press up against a quarter mile of barrier at Wellesely College. Once past the deafening screams and “kiss me! I love runners!” signs, the hard work begins. This year the “work” was especially challenging thanks to a strong headwind and pelting rain. I did my best to keep rain from accumulating on my prescription sunglasses by running with an awkward chin tuck and I tried to avoid the headwind by drafting behind some very generous runners. A few years ago I heard the legendary Joan Benoit say that she “doesn’t start racing until mile 18” and I have never forgotten her words. So with about 8 miles to go I focused on negative splitting the remainder of the course. Nevertheless, along the way, I did stop twice to hug my family – yes twice – as they had separated in the crowds and were at two different points on the course. This required two, time consuming stops – including a nerve-wracking moment while my mom and her frozen hands fumbled with the camera. If that was the difference (it wasn’t) for a sub-three hour marathon I really don’t care. I wouldn’t trade those moments for anything! I ended up negative splitting the race and set a new PR of 3:01:24. As for nutrition, I had a coffee, banana, yogurt, cinnamon and raw egg smoothie for breakfast, a hammer bar about an hour before the start, a Hammer gel every 45 minutes during the race, and Anti-Fatigue Caps and an Endurolyte capsule every hour. I also wore a pair of Hoka Huakas in a marathon for the first time and loved their lightweight and cushioning. 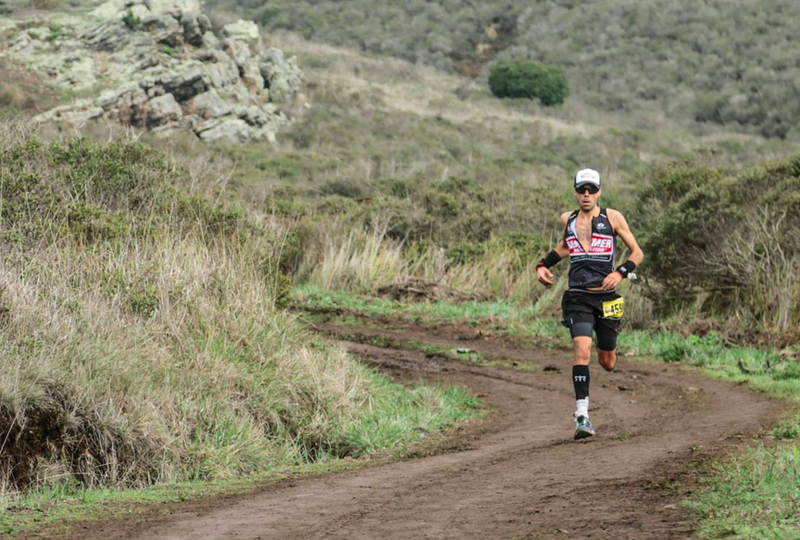 I sure felt like a flatlander as my legs tried to make sense of the steep climbs and plunging descents at The North Face Endurance Challenge Championship Half-Marathon in California. In the past three months running in New York, my total elevation gain and loss is still probably less than the one day in the Marin Headlands. But who cares! The beauty of the course distracted me from the pain. When the going was too tough, I slowed, inhaled the fresh, ocean air and absorbed the views. As I had no idea how I would react to trails and hills, so I started slowly and gradually picked up my pace. I tried to take make up time lost in the uphill struggle by running faster on downhills. I was pleased to finish 15th overall and 2nd in my age group, and above all simply grateful to be there, doing something I love. I am looking forward to next year and running something longer than the half-marathon. Why not stay out there as long as possible? 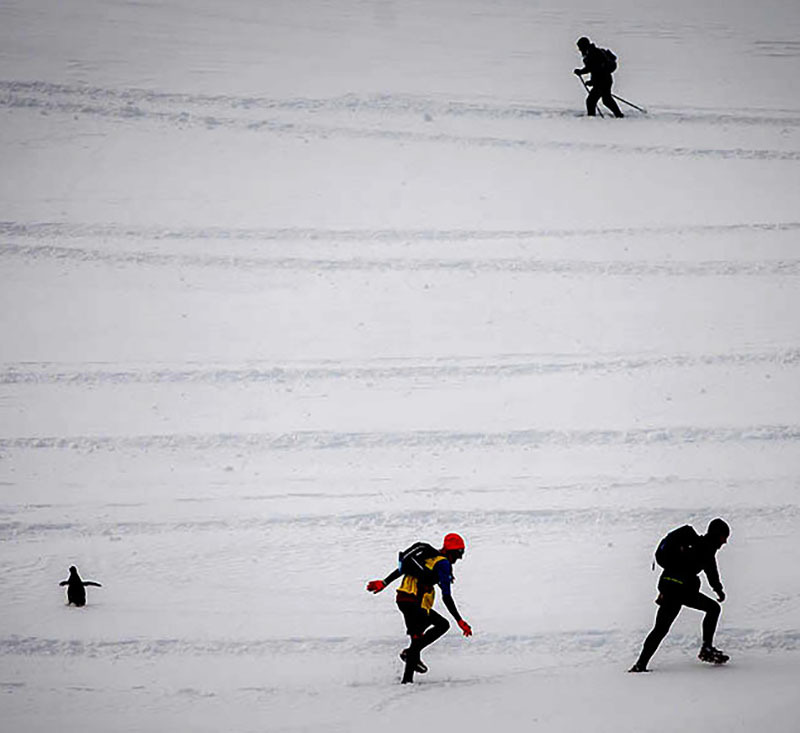 Racing The Planet, Antarctica, 250KM. Thank you for hosting myself (race photographer) and a slew of runners and crew for the 250km stage race put on by Racing The Planet this November. Even though your future is in peril thanks to warming temperatures and greedy nations, who would like to drill to your core and extract your fossil fuel and mineral deposits, you welcomed us and stayed true to your icy form. 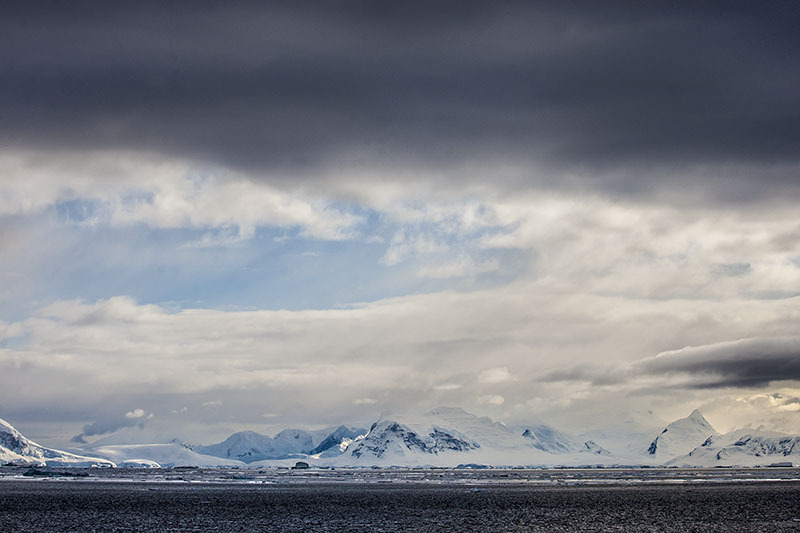 You treated us to your strongest winds and roughest seas, epic vistas, friendliest wildlife, and even some sun, in order to gaze upon your awesome shelf – as in ice-shelf. I’m at a loss when describing you to my friends to the north, except to say that you are utterly predictable in your unpredictability. Remember that day when you lulled us into a sense of well being with your sun and spring skiing conditions, but then whipped up a nasty storm, and then – perhaps feeling guilty – you painted the skies with clouds and colors we didn’t even know existed? By the way, thanks for requiring me to use every single one of my extreme weather garments, as it justified the pricey investments. Oh, also thanks again for the penguins. 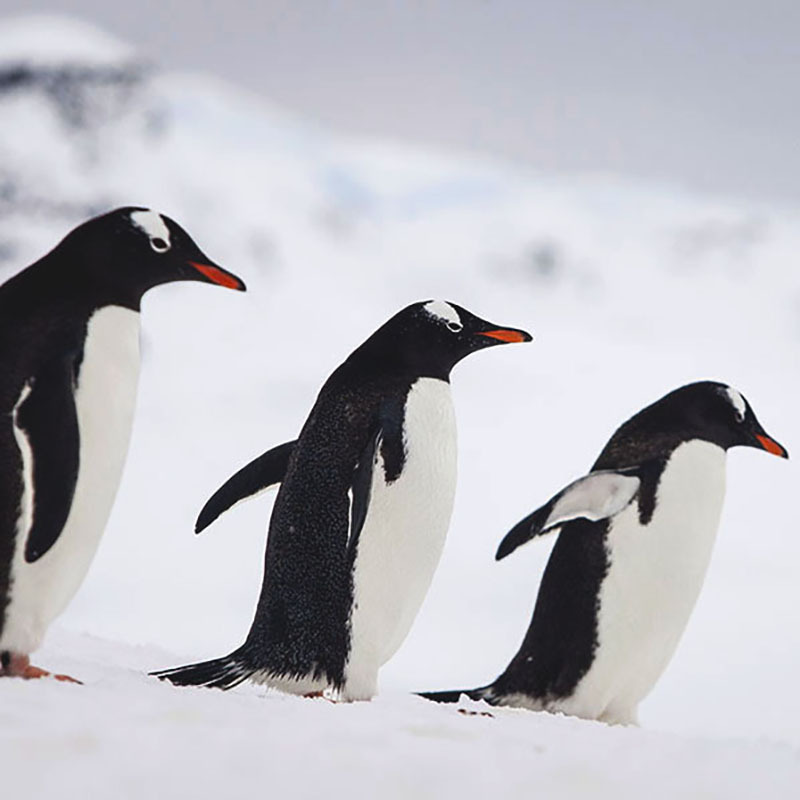 The penguins always made everything ok.
As strange as this may sound, the idea of running for 24 hours straight sounds like a good time to me. You have nothing to worry about except putting one foot in front of the other — and you can test the limits of your body. So, I, along with a few hundred other like-minded individuals, signed up for the North Coast 24-Hour Endurance Run in Cleveland, Ohio. 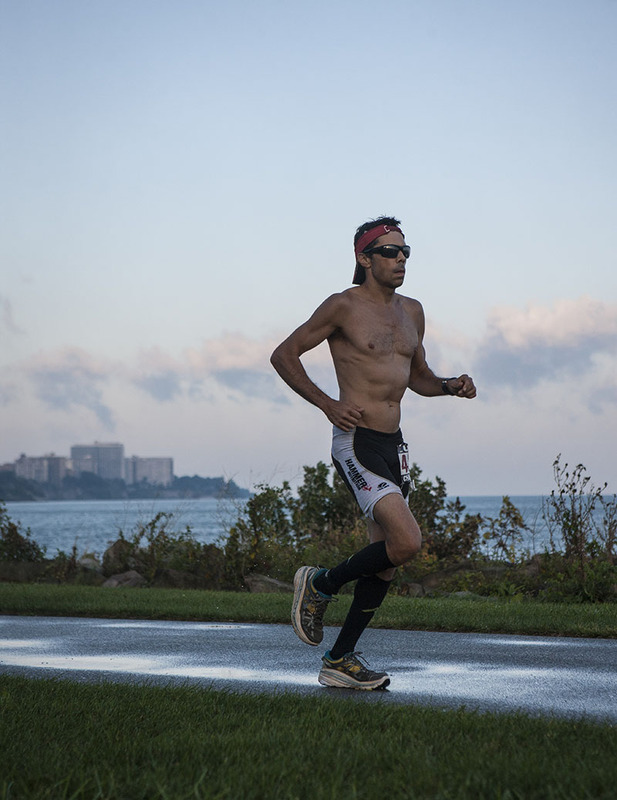 The race began at 9 a.m. on Saturday, September 20, circling around a scenic 0.9 mile loop along the shores of Lake Erie, and would finish at 9 a.m. the next day. In the months leading up to the race, my mileage resembled that of a serious half-marathoner rather than someone prepping for an ultramarathon. Considering my fitness level, I vowed to “take it easy” and just have fun. Admittedly, I had one serious goal: to improve on my collegiate coach Jim Butler’s 24-hour personal best of 103 miles. There is nothing personal with Coach Butler as he is a great friend and mentor, but I assumed the arbitrary goal would help break the monotony. I figured a 12-minute-per-mile pace would achieve that without too much trauma, and after the race, I would slide into Waffle House for a double serving of pecan waffles. I soon learned that a tedious nine-minute pace at mile 10, if maintained, becomes a world-class speed by mile 60, and a velocity for disaster beyond that distance for someone like myself. Adding to the challenge, the weather during the day was hot and very humid, while the night was chilly and stormy, with a couple downpours — not to mention, there was a guaranteed headwind for a section of the circular lap during the entire race. Of course, there was a tailwind for part of the lap as well, but for some reason, I didn’t notice the gentle push from behind as much as the oncoming resistance. About three hours to go. Race Face. Photo By Claudine Ko. The race itself was a fascinating example of what human beings willingly endure. I wondered why a bunch of us were motivated to run the same short loop for an entire day? But then I would sync up with a stranger or a friend, engage in stimulating conversation or crude ultrarunning banter, and somehow, it all made sense. By the end of the 24th hour, to my surprise and my body’s chagrin, I had clocked 118 miles. As this was my first 24-hour race, I was guaranteed a personal best, but I had no idea I would cover that much ground. Fortunately, I had run ultras and 100 milers before and made some important adjustments for this race. For example, for the first time I raced in Hokas. I would not have normally chosen this shoe, but I recently joined up with their testing team and wore a developmental version of next year’s Stinson. Normally, I change shoes during a race of this distance, but I actually didn’t feel the need to do so since the cushioning of the Hoka model was so effective at absorbing the impact of the pavement. And finally, for the first time in a 100-mile-plus race, I had a crew. Claudine Ko was kind enough or crazy enough or worried enough to stay up for most of the race, make some pho runs and even snap photos. There is no “I” in 24 hours. Recoverite time! Photo By Claudine Ko. 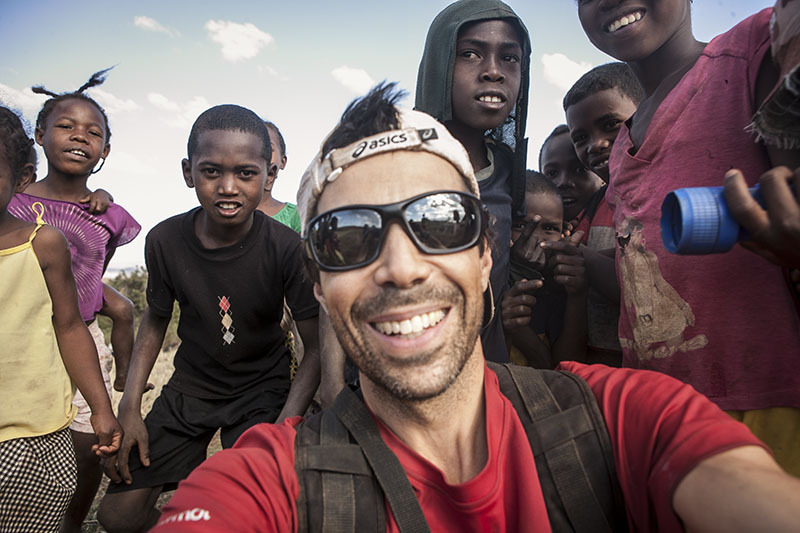 I spent the past three weeks in Madagascar thanks to Racing The Planet, who hired me to document their 2014 Madagascar “roving race.” Racing The Planet is best known for its annual “4 Desert Series” consisting of 250km self-supported races in the Atacama, Sahara and Gobi Deserts, plus Antarctica. 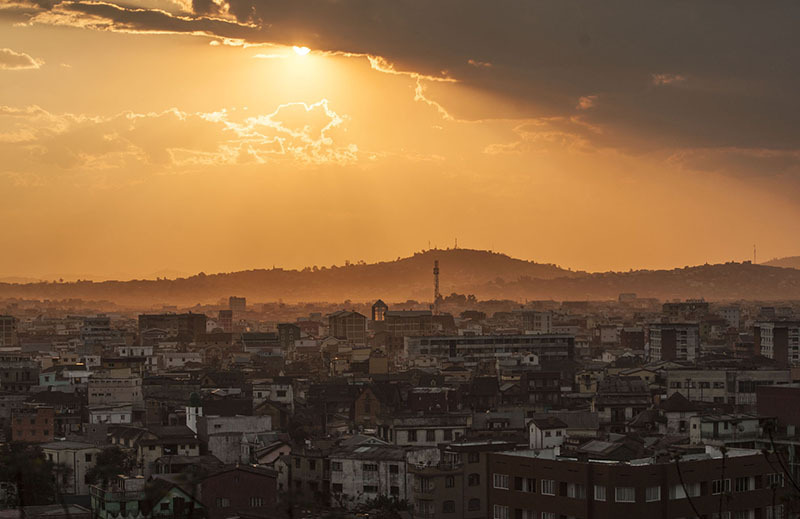 Once a year RTP stages an additional six-stage, 250km race in a new location such as Madagascar. Former roving races have taken place in Australia, Vietnam and Nepal. 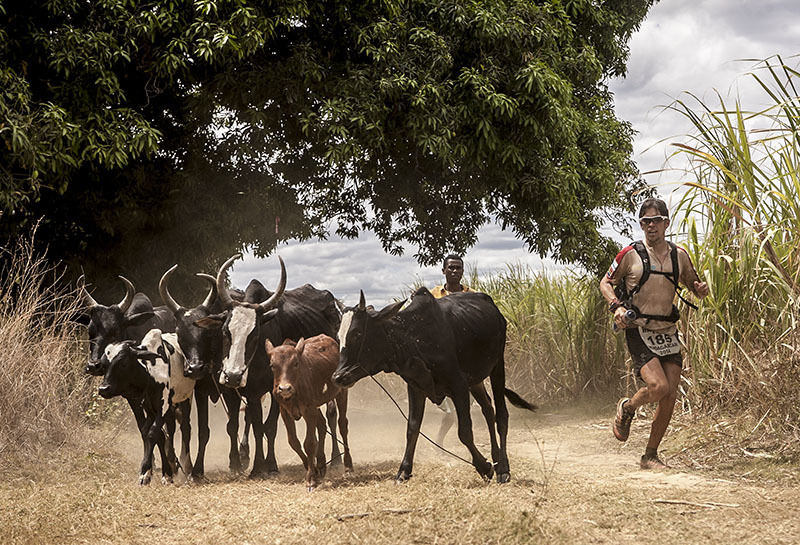 The Madagascar race featured South African ultra running legend Ryan Sandes who confirmed the hype as he convincingly won the first three stages, and eventually held off Wateru Lino of Japan for the overall victory. While I had anticipated this once in a lifetime photography assignment for over a year, shooting the race turned out to be just one of many highlights. Ever wanted to feel like a rockstar without actually needing musical talent? Then Madagascar is the place to be. Salee salee saleeeeeee! the children will shout in greeting as you approach, and in a split second, you will find yourself surrounded by a village of excited kids who want to know your name in order to chant it at the top of their lungs to the rhythm of their handclaps. The children have beau coups de energy so there is not a time limit on the spontaneous celebration. You can bask in the glory as long as you wish. When you are ready, pick someone or something else to celebrate, shout it out, and the song will continue in a new direction. The positive vibes are intoxicating and I found myself smiling my way through the country side. 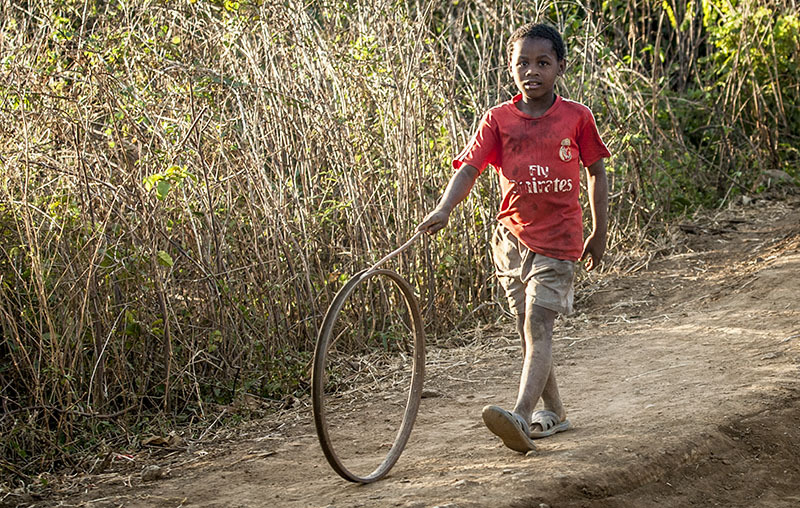 If it were possible to export positive vibes and hospitality, then Madagascar would be rich. “Use your arms to get up this hill! You don’t want your legs to be the only sore muscles tomorrow,” exhorted Chris Cavanaugh, the 3:15 pacer, circa mile 22 of the L.A. Marathon. Up to that point, I had stayed ahead of the group, but the onslaught of heat, hills, and lack of training eventually slowed me to a cramped shuffle. 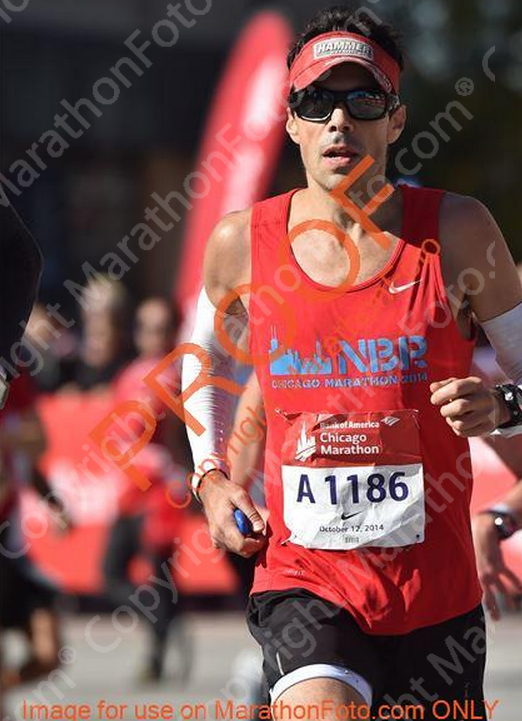 To my surprise, I had been on track to qualify as a 40-year-old for the 2015 Boston Marathon, but had lost hope by the time the 3:15 pack overtook me. Nevertheless, I gave myself a pep talk, popped an Energy Surge, and attempted a final Hail Mary to get back on pace. I quietly fell in behind the four-runner group and coaxed my legs back into a 3:15 canter. To my astonishment, I wasn’t immediately felled by hamstring cramps and kept stride with them over the next two miles. Chris, who was probably oblivious to my presence, said all the right things to keep us focused, instilling us with the belief that we could reach the finish line in Boston qualifying time. His words of encouragement were simple, yet somehow so powerful, I had to consciously force myself to keep my eyes dry. Without his support and the presence of my fellow runners, I would have surely fallen off pace. 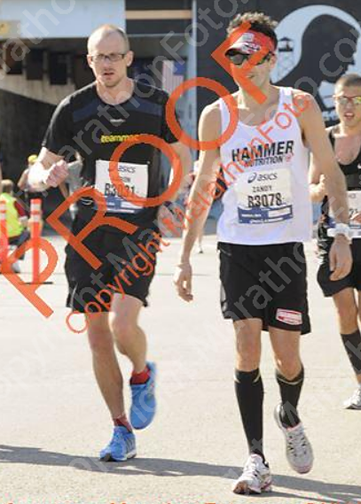 About two miles from the finish, I felt confident enough to begin pulling away from the pace group. The distance slowly increased until I could no longer hear Chris’ voice, though his words rang in my head until the end. These last two miles were my fastest splits all day. 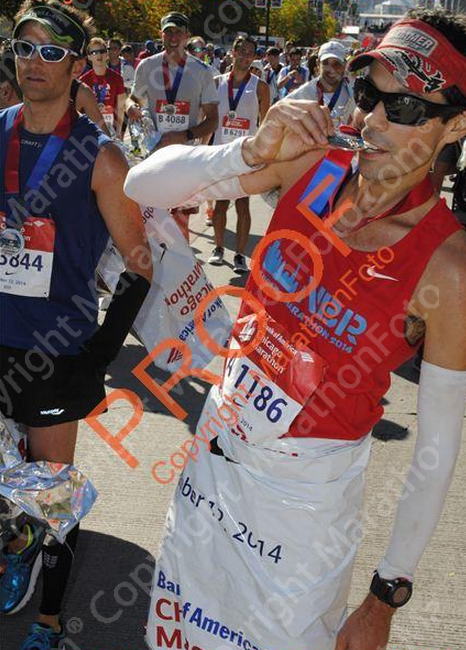 I crossed the finish line in 3:13:25 — good enough for Boston. 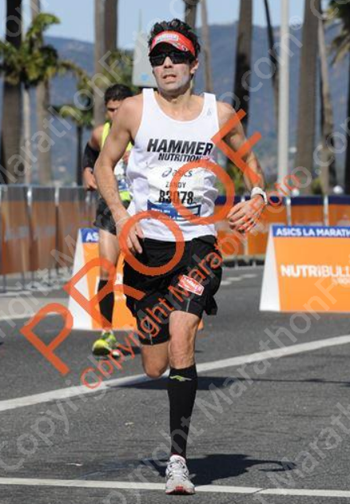 The L.A. Marathon was wonderful for many reasons: superb weather, excellent aid stations, a beach finish, the USC cheerleaders, and most importantly, because I was reminded of the power of the human spirit. 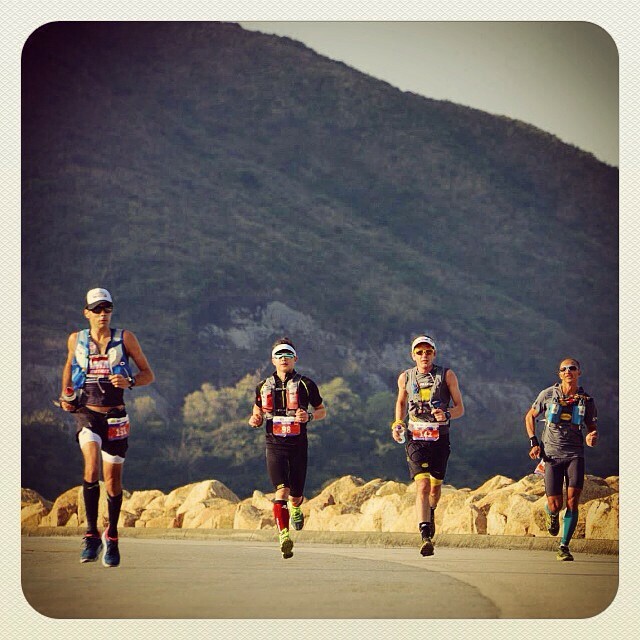 Without the company and support of the other runners, I would not have achieved my little dream for 2015. Forced to walk at mile 20 due to cramps. Finish line and Boston qualifying time in sight.